In a surprise move, the American Institute of Steel Construction announced on July 26 that it would ban all international schools from participating in the National Student Steel Bridge Competition, modify existing rules, and terminate its long-time partnership with ASCE for the competition, effective immediately. The Memorandum of Understanding governing the partnership between the two organizations was set to run through 2021. AISC organized the first local competition in Michigan in 1987. A national competition followed in 1992, and AISC and ASCE later joined forces to shape steel bridge as an official ASCE Student Conference competition. Under the terms of the partnership, AISC retained the intellectual property rights to the competition. Rules were developed by a committee composed of members from each organization. 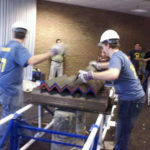 ASCE’s Committee on Student Members determined the eligibility requirements, consistent with those for other ASCE student competitions such as the National Concrete Canoe Competition. Regional steel bridge competitions were signature events at ASCE regional Student Conferences and AISC organized the national finals. • A vote by AISC’s board to exclude university teams from outside the United States from the national competition, despite their participation since at least 1999. • A desire to open the competition to teams that do not meet ASCE’s eligibility standards for national competition. 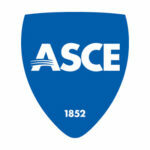 ASCE could not reconcile either change with its organizational mission and values. “ASCE strongly believes that ASCE-affiliated competitions should be open to all ASCE student chapters that meet eligibility standards for national competition,” read a letter from ASCE President Kristina Swallow and ASCE Executive Director Tom Smith, sent to Student Chapter advisors this week. According to the statement, these eligibility standards are intended to ensure that all student competitors benefit from educational and professional development that they will carry forward into their careers. ASCE had hoped to reach a resolution that would, at a minimum, limit disruption for the 2018-2019 academic year. AISC’s recent announcement appears to make such a compromise unworkable. AISC’s abrupt and unexpected changes have created confusion and concern for many of the teams planning to compete in this year’s competition or host regional Student Conferences. In its announcement, AISC indicated that it would proceed with plans to operate the steel bridge competition this year, with the locations of the regional competitions (formerly part of the ASCE regional Student Conferences) still unknown. AISC informed two Canadian schools slated to host ASCE regional conferences that they could no longer host the associated steel bridge regional competition. Other faculty advisors and hosts schools are still assessing the impact of this change on their students. Brian Houston, the Student Chapter advisor at the University of Pittsburgh–Johnstown, is organizing the 2019 Mid-Atlantic Region Student Conference for next April. “There’s a business meeting at the conference, and it really is the one time of the year where all the schools get to sit down and talk about different issues,” Houston said. “And it introduces students to some amount of professionalism in their career, and how you handle people with different viewpoints. Up the road at the University of Akron, Student Chapter Faculty Advisor Steve Duirk started planning the 2019 Ohio Valley Student Conference back in April. With the new school year only weeks away, ASCE is focused on supporting its Student Chapters through this transition. 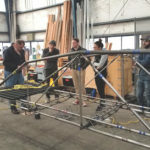 Immediately following AISC’s announcement, ASCE’s Executive Committee appointed a Student Competition Task Force that is working on strategies that address the short-term challenges associated with the 2019 Steel Bridge Competition, and the longer term needs for innovative, global student competitions. The task force will deliver its initial report later in August. “Of course I’m disappointed by this turn of events, especially for those students and faculty that have already begun planning for the upcoming year. However, I’m excited about the long-term opportunity this creates for ASCE and all of our Student Members across the globe,” Swallow said. ASCE Student Conference hosts and Student Chapters should expect to receive more specific guidance from ASCE in the very near future about how to handle this situation. Steel bridge competitions have been very rewarding for the many who I know that have taken part and I have enjoyed being a spectator and advisor over the years. Thus, it is disappointing that the formal AISC & ASCE event will not continue. Nevertheless, I concur with another sentiment written here/above that this presents opportunities for other events and structural related competitions with different materials. As a past faculty advisor for our ASCE Student Chapter, and past Chair of the Department, I was always excited about the bridge competition – both as an intellectual exercise and a great learning opportunity and experience for our students. I have also always considered and counted the AISC within the extended ASCE family of engineering professionals. Apparently, the leadership of AISC does not count itself within this extended Civil Engineering family. Too bad for them and, indeed, all of us! On the bright side, I think that this action presents ASCE and the student chapters in the US and abroad with a wonderful opportunity to move beyond the dated confines of steel construction and forge ahead into the bright future of new and innovative structural materials — carbon fibers, various composites, etc., and if AISC wants to join in on the action, by golly we should let them in, but we should insist on leading the show! As a long time ASCE member, dating to my undergraduate days at West Virginia University, I am totally appalled and outraged by this apparently unprovoked action by the AISC Board of Directors. I would urge the ASCE Board to demand a full and complete explanation of the rationale for this action from the AISC Board at the earliest possible date. I would also suggest that if it is possible for ASCE to identify those members of the AISC Board who possess ASCE membership, these individuals be personally and directly contacted for an explanation of what has just transpired. These actions by the AISC Board may border on unethical professional conduct.